Did you know that there are more than 350 different shapes of pasta? Making pasta seems so simple – however – there are some rules when it comes down to matching the right pasta shapes with the right Italian sauce. 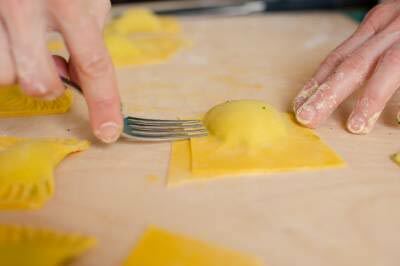 It all depends on thickness and texture of the pasta in order to turn a good sauce into a magnificent one. A simple rule of thumb for the best pasta & sauce matching is to pair thin pasta with light sauces. The following list will give you an overview of the pasta that will go best with our favourite sauces. For more recipes and cooking tips read more on our blog. Of course, we all know what pasta to choose for Lasagna. Lasagna noodles are thick, wide noodles that are used to create layers before, traditionally, covering them with ragù, bechamel, and Parmigiano-Reggiano and then baking the dish in the oven. For other oven baked pasta dishes you can also use Penne, Maccaroni, Fussili, Ziti or Rigatoni as their tubular shape and shortness is perfect for holding thick and chunky sauces. Stuffed pasta filled with cheese, meat or vegetables such as Ravioli or Tortellini is the perfect match for cream-based sauces or light broth to let the flavours of the fillings stand out. In addition, Orecchiette, Farfalle or Papardelle are also ideal when serving a chunky, cream sauce. Once again, due to their thickness and rough texture, they can hold and capture the chunkiness of the sauce. Aglio e Olio as well as Pesto are much lighter sauce versions and due to their oil base great for long and thin pasta like Spaghetti and Linguine. Since these long expanses of pasta need lubrication, oil-based sauces will coat the pasta without drowning it. Another delicious sauce for the thinner shaped pasta is the famous Carbonara sauce based on egg, cheese and bacon. Spaghetti can also go very well with light tomato sauces. However, the chunkier and richer the sauce, the shapier and thicker the pasta should be. Therefore, meat-based ragus or vegetable-based tomato sauces find their perfect match in pasta that can hold the sauces’ texture. Therefore, Fusilli, Rotini or Cavatappi are much more appropriate and will make your chunky tomato sauce even more delicious. Exciting fact! Unlike most people would assume, Tagliatelle – and not Spaghetti – go with the world famous Bolognese sauce. 1. Only rinse pasta if you’ll be using it in a cold pasta dish. 2. Pasta should be sauced immediately, while still hot. 3. Taste the pasta to see if it is done. Perfectly cooked pasta should be “al dente” which means to the bite but still cooked through. If you like to learn about Italian cooking in an authentic environment, see our cooking holidays.